Let’s talk about the night that I ate snack mix for dinner. In fact, now that I think about it, I ate snack mix for lunch, snack AND dinner. This stuff is ridiculously addicting. As a side note, I also had a good dude-I’m-10-months-pregnant-week and ate bacon popcorn for dinner. A lot. Last year was my first attempt (or, at least my first attempt since fifth grade) making a homemade snack mix of some kind. I made a pretty good batch, a rather atrocious one that stayed soggy for it’s entire life, a buffalo flavored one (it was… meh) and a BBQ one (really awesome!). I knew that this year I wanted to try and make a killer version – mostly because it would serve as the perfect little party appetizer and snack, would work as homemade gifts and would sustain me through the month of December while I eat cheese and crackers and hold a newborn. At least I got that last part right. 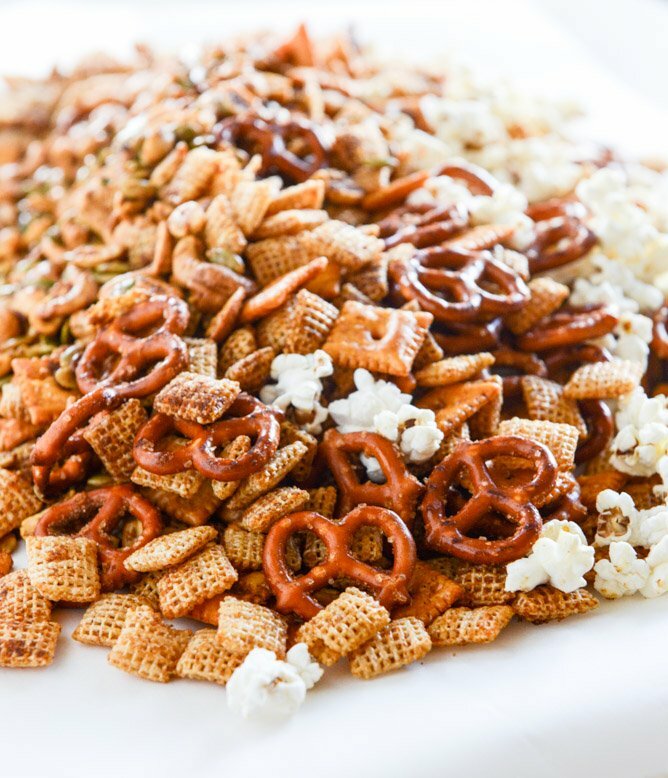 I like to think of there being two different components to this mix: we have the snack mix that contains the pretzels, nuts, chex, cheez-its (omg mandatory) and what not. Then we have the bacon fat popcorn. I LOVE mixing the two together. The popcorn takes on some of the spice, it’s a completely different texture from the rest of the crunchy bits, um, it’s tastes insane because it’s popped in freaking bacon fat and and and did you know that popcorn is a whole grain? Yeah yeah, so this is healthy. Sometimes I really like my brain. My only suggestion is that when serving, pop your popcorn right before and toss (you can even make a microwaved version in a pinch) just because popcorn can get rather soggy if it sits, you know? 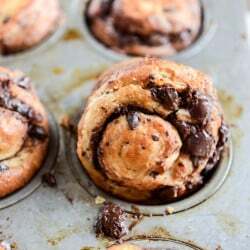 Or package the two separately, give them as a gift with the directions to mix and try not to eat the entire batch on the way to your friend’s house. OR… make a huge batch and sit at home and stuff your face. With friends. Or not. Combine the chex, pretzels, cheez-its, cashews, peanuts and pepitas in a large bowl. Heat a small saucepan over medium-low heat and add butter. Whisk constantly until the butter is sizzling and brown bits appear on the bottom of the pan, about 5 to 6 minutes. Constantly stir! Remove the butter from the heat immediately and pour it into a bowl. Whisk in the brown sugar, garlic powder, smoked paprika, salt and pepper until combined. Pour the seasoned butter over the chex mixture and toss well for at least 5 minutes until everything is moistened and covered. Spread the mixture out on the baking sheet. Bake for 1 hour, tossing every 15 minutes. Remove from the oven and let cool slightly. To make the bacon fat popcorn, heat a large nonstick skillet or pot over medium heat. Add the bacon grease and once it’s melted, add in the corn kernels. Shake the pan slightly and as soon as the kernels start popping, cover and continue to shake the pan until it’s all popped. Remove from the heat. As soon as the chex mix comes out of the oven, I like to stir the popcorn into the mix in batches so it can get slightly seasoned too. You can also drizzle it with bacon fat or butter and salt and pepper. 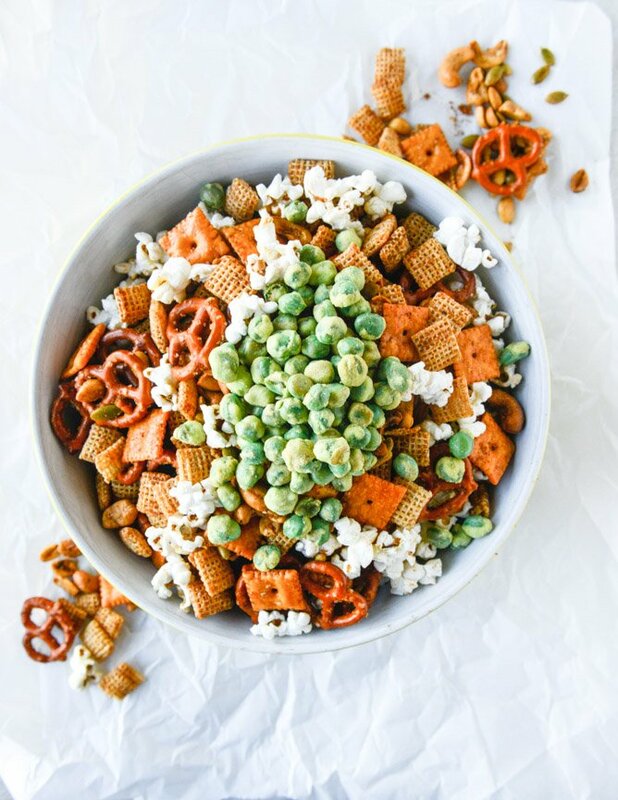 Toss the chex mixture, popcorn and wasabi peas together to create your mix. Serve! This can be stored in a resealable plastic bag (once cooled) for a week or so. I find that after that it does start to get a little stale or soggy. I think I’m going to make that picture with the row of chex, row of seeds, row of cheez its, etc my computer wallpaper. And maybe my kitchen wallpaper. Beautiful! This looks amazing. I adore these pictures, and I love that you added bacon fat popcorn.. amazing! 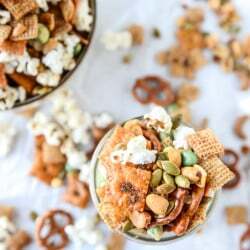 Cheez-Its, Chex, WASABI Peas, the popcorn, salty and sweet and omg every amazing texture all in one thing – I totally want this! And I don’t even eat bacon :) Pinned! Oh my actual lord! Bacon fat popcorn sounds amazing! I also love your brain. This sounds so addicting! This looks delicious! I love making snack mixes. My grandma makes a snack mix for her holiday party every year and I’ve been addicted since I was a little kid. Fortunately she gave me a few pointers and I’ve had success making it on my own. I love finding new things to add to it though! I’ve considered adding popcorn for years but never actually tried it. That might have to happen soon now! I make Snack Mixes all the time with butter, must taste good with bacon fat. This mix is gorgeous! What a coincidence, I just made some snack mix myself. Mine has Corn Chex, pretzels, Goldfish crackers, peanuts, cashews, sunflower seeds, and white cheddar popcorn. It reminds me of my grandma, who passed away this year, because she always used to make it around the holidays. Really have to try that bacon fat popcorn, though! Your brain is marvelous! We all love it!! All day I’ve been thinking about this since I saw it on Pinterest! Sounds unbelievable! I have got to get me some bacon on the stove! Just for the fat this is totally worth it. The combination of peas, wasabi, sweet and salty cereal; I am in a heaven. This sounds delicious! My kids love wasabi peas. What a yummy mix – your brain certainly does work well. This is the most insane party mix I have ever seen. If I had this I would be eating it for lunch, snack and dinner too. Out of this world! Chef just told me I had to stop using bacon grease in recipes (mostly due to the fact we’ve collectively gained a million pounds this holiday). But I have a feeling I can hide it for one more recipe! YUM! Do you use raw nuts or already roasted? HOW the F did I miss this post? This looks amazing. I’ll have to add bourbon , because, bourbon. BACON FAT POPCORN!? Now I TOTALLY understand how this is the most addicting snack mix ever. Looks insanely delicious! did anyone actually try this recipe?! !